Pre heat oven to 450 degrees F. Have a small baking pan or medium baking pan ready (any baking pan that can hold potatoes in a single layer). Wash, peel and cut potatoes into 1/2-inch thick slices. Add potatoes and all other ingredients into the baking pan and toss well until all the spice mixture and oil evenly coats the potatoes. Arrange them in a single layer and place the baking pan in the middle rack of the oven. Bake for about 30 minutes, until a knife inserted in the middle of a potato, goes in easily without any resistance. Spread about 1/2 tablespoon mayonnaise on one side of each bread slice. Place 4 slices (mayo side down) on a work surface. Spread 1/4th each of avocado, pesto, 1 slice of mozzarella, roasted potatoes, tomato slices, 1 slice pepper jack, close with remaining bread slices (mayo side up). Pre heat your waffle iron according to manufactures instructions. Gently place 2 sandwiches in the middle of the iron, close and cook until golden brown, about 3-5 minutes. Remove gently and serve hot. Heat a large skillet over low heat. Gently place sandwiches and cover. Cook turning once, until golden brown on both sides (about 3 minutes per side). Sandwich might be a little difficult to turn (these babies are loaded), use a wide spatula and try your best. Press down on sandwiches (once or twice) to ensure even cooking and to melt cheese. 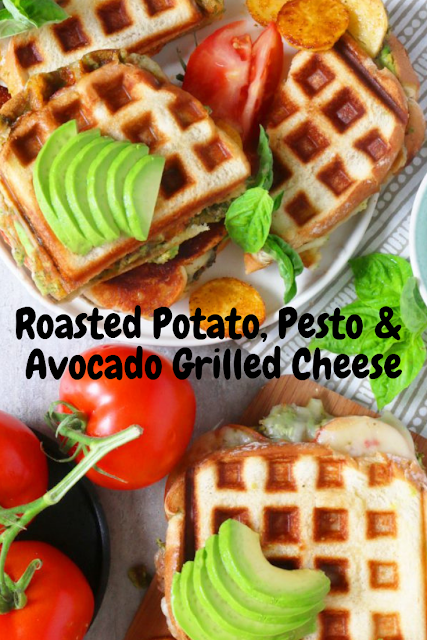 0 Response to "Roasted Potato, Pesto & Avocado Grilled Cheese"